This is a broad term used to describe an issue involving the teeth and supporting tissues that is of high importance to be fixed or treated by a dentist. Most true dental emergencies involve a toothache or other pain in the mouth or jaw joints (TMJ). Pain can originate from the tooth, surrounding tissues or can have the sensation of originating in the teeth but be caused by an independent source (sometimes sinuses). Depending on the type of pain experienced we can determine the likely cause and treat the issue appropriately. This office was established specifically to treat dental emergencies while the problem is acute. You do not require an appointment to be seen, drop by the office today, or call to schedule an appointment time that is convenient for you. A dental implant is an artificial tooth root made of titanium metal. 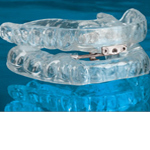 It is inserted into the jawbone to replace the root of the natural tooth. 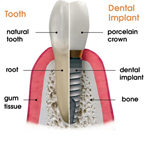 A replacement tooth is then attached to the implant. The implant acts as an anchor to hold the replacement tooth in place. If you are in good general health, have healthy gums and have enough bone in the jaw to hold an implant, dental implants might be right for you. If your jawbone has shrunk or if it has not developed normally, you may be able to have a bone graft to build up the bone. A bone graft is a way of adding new bone to your jaw in the area where the implant will be placed. For more information about dental implants click here. At Fundy Dental Centre we can perform both the surgical placement of a dental implant and restore an individual tooth or denture on top of an implant. Implants are now the gold standard to replace a single tooth, and are also a great option to replace multiple missing teeth, or to stabilize partial and complete dentures. Call today for a free (*) consultation to see if you are a good candidate for dental implants (902-681-9111). 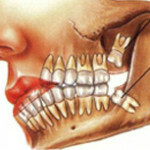 Oral surgery is any procedure that involves cutting into or removing tissue from your mouth. It includes procedures like removing a tooth, gum surgery, and receiving dental implants. Oral surgery also includes getting rid of diseased tissue from the mouth, correcting jaw problems, or repairing a cleft lip or palate. These latter procedures are usually performed by an oral & maxillo-facial surgeon (OMFS) after referral from your general dentist. Our office performs many surgical procedures, including simple and surgical tooth extractions, wisdom tooth removal, dental implant placement and other minor surgical treatments. We also work closely with our local OMFS to provide the most appropriate care for our patients. Dental surgery is easily performed with local anesthetic (freezing), but many patients choose one of our sedation options for these appointments, see below. Anxiety at a dental office is often a significant barrier to treatment. Dental fear is deeply seeded and some patients cannot get past their anxiety to receive the dental treatment they require without help. At Fundy Dental Centre we try to make our patients' experience at the office as comfortable as possible, and offer a number of sedation options to achieve this, including pills taken orally, nitrous oxide gas and intravenous (IV) moderate sedation. Almost all sedation options in dentistry are considered conscious sedation. Conscious sedation refers to the process of relaxing a patient (depress their level of consciousness) so they do not care about the dental procedure in progress, but respond appropriately to verbal commands. A patient is not put to sleep, but sedated patients may fall asleep during the dental procedure. Also, many forms of conscious sedation have an amnesic component, so a person will likely not remember the procedure the next day. For more information about sedation options and whether or not you are a candidate click here, or contact our office for a free (*) consultation and evaluation. Teeth tend to break at the most inconvenient times. Sometimes a broken tooth is a true dental emergency, but often is less urgent. Non-emergent tooth fractures can be scheduled at your convenience with your regular dentist. Due to the unpredictable schedule at our office we cannot guarantee same day treatment for these procedures on a walk-in basis, but feel free to call ahead to determine our schedule that day. At the very least, after an exam and x-ray we can smooth a sharp edge or patch a cusp until you receive definitive care at your own dentist's office. Root canal treatment, also known as endodontic treatment, is the process of removing an infected, injured or dead nerve from your tooth. The space inside the hard layers of each tooth is called the root canal system. This system is filled with soft dental pulp made up of nerves and blood vessels that help your tooth grow and develop. When the nerve of a tooth becomes infected, a successful root canal treatment lets a person keep their tooth rather than having to pull it out. Keeping your tooth helps to prevent your other teeth from drifting out of line and causing jaw problems. Saving a natural tooth avoids having to replace it with an artificial tooth. 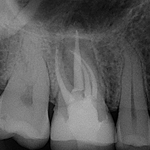 Root canal therapy does have a bad reputation, but is a successful procedure, especially when the treated tooth has a crown placed afterward to protect the tooth from breaking. At Fundy Dental Centre we will advocate that you keep your own teeth whenever possible. Many of our artificial tooth replacement options are very good, but there is no substitute for the real thing. If an infected tooth is restorable (can be fixed, which is not always possible), you should consider root canal treatment instead of extraction. In an emergency situation we can remove the infected nerve/pulp (start the root canal), and then you can consider rescheduling an appointment here or with your own dentist to complete the root canal, or decide to remove the tooth if this is more appropriate in your situation. If you have dental questions or concerns that are not classified as a true emergency as we define it, we are still happy to provide you with our opinion and diagnosis. An appointment for specific examination with a dentist can be scheduled by calling our office. For reduced wait times, walk-in consultations should come by the office between 11am-3pm on Tuesday to Thursday. A free (*) consultation is available, during those times, with one of our knowledgeable support staff. Patients that have a regular dentist, but are interested in treatment at our office should consult with their own dentist first. We would prefer a referral letter from your own dentist with the specific treatment planned, and any radiographs already taken can be forwarded to our office. For more information click here. (*) A free consultation is available with one of our knowledgeable support staff during specific times of the week (11am to 3pm Tuesday to Thursday). Click the appropriate link for further information on who is a candidate and the specific procedures for one of our specialized services (dental implant, sedation, oral surgery). A fee is charged only when you require a radiograph and examination by the dentist - this is necessary if treatment is to be pursued.